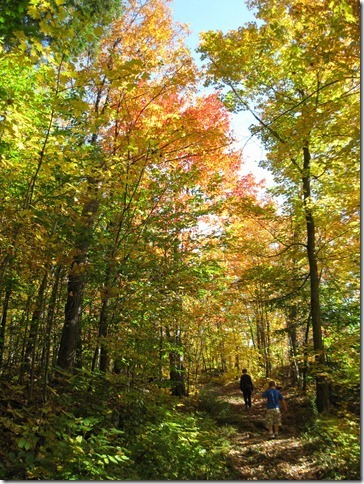 The Canadian Parks and Wilderness Society-Ottawa Valley is holding a Nature Hike on Sunday, October 30, 2011 at Forêt La Blanche, one of southern Quebec’s last remaining old-growth forests. Meet at 1:00 p.m. at the interpretation centre, Forêt La Blanche ecological reserve, 300 chemin Saddler, Mayo, Quebec (about 10 minutes north-east of Buckingham on route 315). The easy 3 km hike is happening rain or shine and will take about 2 hours including stops. A portion of the fee ($5 adults, $3 children) will be donated to CPAWS-OV, which has been working to protect the La Blanche Forest. Contact ov-outreach (at) cpaws.org or call 613-232-7297 to arrange car-pooling if you need or can offer a ride. Local botanist Martha Webber offers Families in Nature walks to help families discover nature and the outdoors. The walks take place on the first Sunday of each month from October through May in and around the South March Highlands. For information contact Martha at marthagw (at) gmail.com. If you prefer to set out on your own, trail maps and information are available via the National Capital Commission’s redesigned website for Greenbelt trails, Gatineau Park trails and other paths and parks. There are still some great fall colours to experience. You can also support Ottawa’s forest heritage by purchasing a work of art by one of 14 local artists during an online auction October 22-31 to benefit the South March Highlands. Proceeds will be split between the artists and South March Highlands–Carp River Conservation Inc. which is working to protect the South March Highlands and the Carp River floodplain.